Art Parc is a bold and graphic series of painted interventions referencing Morecambe's site-specific nostalgia. 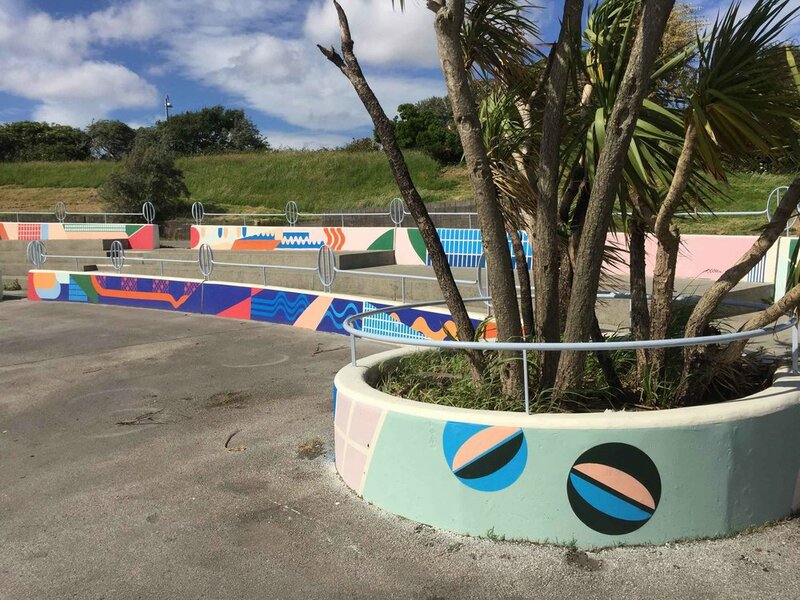 Our client Deco Publique, a local arts organisation, commissioned us to create large scale patterns which we hand-painted onto the existing concrete walls. We drew inspiration from graphics and architectural shapes which compliment the heritage and site-specific nostalgia. The architectural art deco links are an important feature we have considered when researching the features of the space. The modular shape of the 1930’s Midland hotel, and the lost graphic art of Eric Ravilious was a great source of inspiration. We looked into the abstraction and modernisation of the nostalgia related to the space by drawing colour and graphic inspiration from both vintage and contemporary sources. Intricate details and repeating motifs allow for continued curiosity in the artwork upon repeated viewings. We created attractive and intriguing wall treatments, utilising colours and patterns to create a point of focus, curiosity and contemplation for the public. The curved pump house structure was the ideal opportunity for a continuous design which can be viewed from numerous angles. In developing floor treatments, we created a playful route or game throughout the space creating an interactive element to the artwork. Shapes from the floor patterns are replicated, animating the environment and creating a playful connection between the different surfaces. .